Case of 144 pairs. 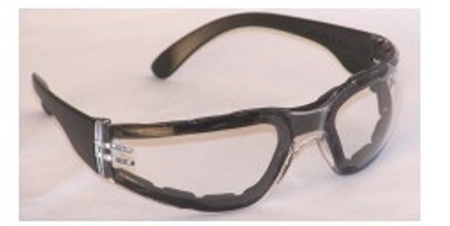 Chirons wraparound safety glasses with black temples and clear lenses. These glasses have padding on the inside edge of the lens to help assure a more snug fit and keep out dust. Glasses that provide the protection of goggles! Shatter resistant polycarbonate lenses that shield 99.9% of UVA and UVB light. Light and comfortable fit. Zero distortion lenses. Sporty and stylish with wrap-around lenses. Hard coated, scratch resistant lenses. Precision engineered to provide maximum eye protection and visual clarity. Meets ANSI Z87+ safety standards. 12 dozen pairs - Calculate out the outstanding price per pair!